Yuri Kochiyama is a revolutionary in every sense of the word. For the past six decades the human rights activist, who was comrade of Malcolm X and embraced him after he was shot in 1965 at the Audubon Ballroom, has been at the forefront of the movement to gain equality for people across the globe. Kochiyama, a Japanese American, was first exposed to injustice during WWII. Her father was arrested after the Japanese bombed Pearl Harbor and her family became part of the 110,000 Japanese Americans to be forced by the U.S. government to live in internment camps. 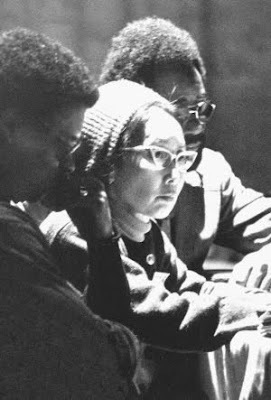 Kochiyama and her husband moved to Harlem in the early 1960s. It was there that she nurtured her six children and her passion to fight injustice. Kochiyama worked with black parents to improve schools. After meeting Malcolm X at a political event in the 1960s Kochiyama became acquainted with him and they wrote one another during Malcolm X’s life-changing hajj pilgrimage to Mecca. As Malcolm X prepared to make what would have been his final speech he was shot and Kochiyama rushed to the stage and held his held during the final moments of his life. 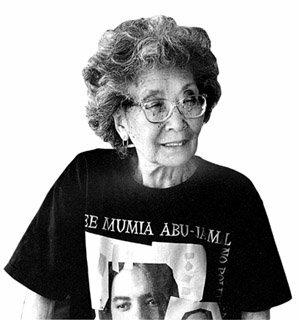 Kochiyama, who has said her commitment to human rights is connected to the black liberation movement, still continues her activism today. The release of Mumia Abu Jamal is among the issues she advocates. Her work is chronicled in her biography Heartbeat of a Struggle: The Revolutionary Life of Yuri Kochiyama. An incredible documentary Mountains That Take Wing: Angela Davis & Yuri Kochiyama - A Conversation on Life, Struggles & Liberation also gives insight into what motivated her activism. That film shows Kochiyama in recent years at rallies speaking intensely through a bullhorn, leaning on her walker and fighting stronger than ever for human rights.